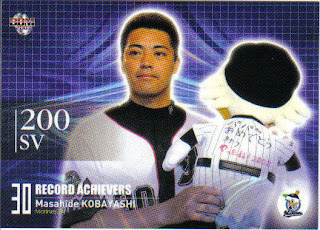 From top to bottom that's his 2000 BBM Late Series (#557), 2001 Upper Deck (#174), 2003 BBM Japan National Team (#12), 2005 BBM Nippon Series (# 06), and 2007 BBM 1st Version Record Achievers subset (#482). 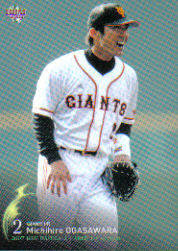 Michihiro Ogasawara of the Giants and Yu Darvish of the Fighters won the MVP awards in the Central and Pacific Leagues respectively. 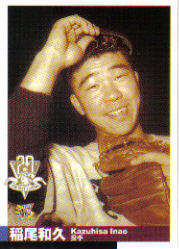 Keiji Uezono of the Tigers and Masahiro Tanaka of the Eagles were named Rookies of the Year. 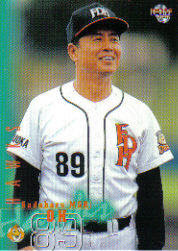 Hall Of Fame pitcher Kazuhisa Inao passed away today from cancer at age 70. His stats can be found here. Gary Garland has written a fantastic obituary/biography on his web site. 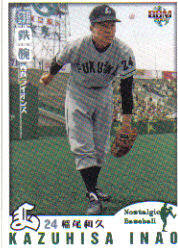 While Inao is amongst the career pitching leaders in many categories, perhaps his biggest claim to fame was his performance in the 1958 Japan Series, pitching for the Nishitetsu Lions against the Yomiuri Giants. 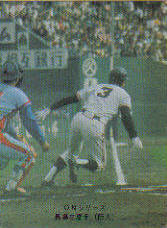 The article in Mainichi Daily News states that Inao led the Lions back from a 3-0 deficit, starting and winning Games 4, 5, 6 and 7, along with hitting a game winning home run in Game 5. What the article doesn't mention is that he was the losing pitcher in Games 1 and 3. 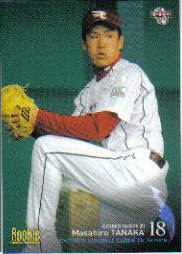 Inao actually appeared in 6 of the 7 games in the Series and got a decision in all 6 games. 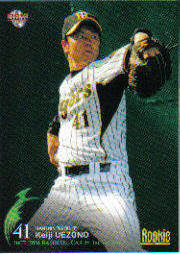 He pitched 47 innings of the 62 pitching innings in the Series. Needless to say, he was the MVP of the Series. 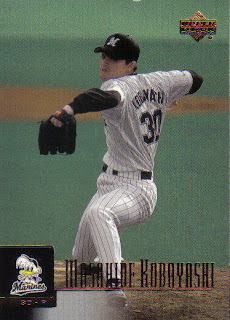 He also pitched in all of the final 9 games during the regular season to help the Lions beat out the Hawks for the Pacific League pennant. All in all that year, he appeared in 72 of the Lions' 130 games. Lions fans came up with a special prayer for him - "Kamisama, Hotekesama, Inaosama" (God, Buddha, Inao). 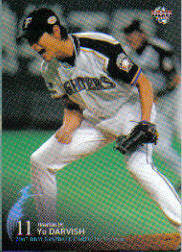 Hello and welcome to my blog about Japanese Baseball Cards. 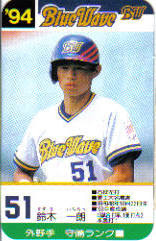 I've been collecting Japanese Baseball Cards for a few years now and I've been looking for an English language web site that can be a guide to what's out there. While I've found much useful information out there, I haven't found any place that can consistently tell me what something is or what new products are coming out. So I decided to take a crack at it myself with this blog. 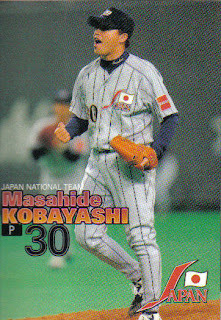 1. Who died and made you the expert on Japanese Baseball Cards? I would not describe myself as an expert. I'm just a collector who's willing to share some knowledge. Hopefully, someone will find it useful. 2. Do you speak/read Japanese? I can't read or speak Japanese. I would love to learn to, but with a family and a job (not to mention an hour commute each way to that job), I don't have time. Maybe someday. 3. Who are you a fan of? I'm a fan of the Boston Red Sox and the Chunichi Dragons. And yes, I've really enjoyed this fall. 4. What can you tell me about some topic in Japan? Probably not a whole lot. I've never been to Japan and I don't profess to know or understand a lot about Japanese culture. I grew up watching the Ultraman; Speed Racer; Kimba, The White Lion and Star Blazers TV shows as well as Godzilla and Gamera movies, but I don't think that that really helps much. 5. You do know that Star Blazers is really Space Battleship Yamato, don't you? 6. Where do you buy your cards? 7. What are you going to blog about? Like every one else who blogs, whatever I feel like. 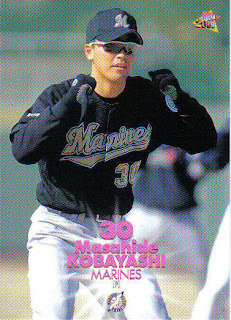 I'd like to be informative about what cards are out there for players who are coming to the majors from Japan as well as what new cards are out. 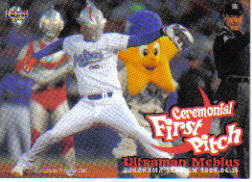 I'll probably do a few posts talking about the different card companies and their histories. 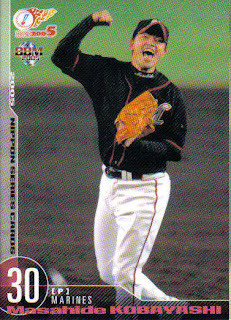 There are already blogs that do a much better job than I would talking about things happening in Japanese baseball itself, so I'll probably not post much on those topics unless I have some cards that relate somehow. Or I just feel like it.